When one owns a smartphone, the features that you get with them slowly begin to take over for other devices that you may have used in your day-to-day life. Currently I use my cell phone as my primary camera, camcorder, computer, gaming console, and -ahem- phone amongst other things. One of these other things is a radio. Enter the Thumbs UP! Boom Box Speaker from Kinnucans. Opening the packaging revealed an attractive, surprisingly lightweight speaker that looked like the speaker system the Blues Brothers strapped to the roof of the Bluesmobile to advertise their show. It has a nice, slick exterior with an on/of switch, micro USB charging port, and an audio in jack. Syncing your cell phone to it is a cinch as the only thing you have to do is place your phone on top of it with the speaker pointed toward the magical elves inside the top portion of the speaker. Now, the magical elves thing is really just an assumptive phrase since I couldn’t figure out what was amplifying the sound once I placed the phone on the speaker. I thought it may have a mic inside the top of it, but I tested this out by speaking into it without success. Then I thought maybe it used the same principle as the life hack where you place your phone in a cup or something like that, but if that were the case, it would have worked without power getting to it. To put the speaker through its paces, I first used a phone that is oversized and out of the ordinary – a Samsung Galaxy Mega while playing a podcast that always seems to have low volume levels. Once I placed the phone over the speaker, it began working as advertised without much effort. Subsequent tries are a little more hit or miss, but I can always get it to work in a short amount of time by moving it around – an amazing feat considering that not only is the phone I was testing huge, but it also had a really thick case on it. This subsequently lead to my first real criticism in that the speaker does not have its own volume control. The case is a folio-style design, meaning that it has a flap on the front to protect the screen, so every time I wanted to lower or raise the volume, I had to flip open the case. My second test was conducted with a more widespread device – a Samsung Galaxy S4. I already knew that the highs the speaker produced were good, but I wanted to see how much bass this little monster could give me. Disappointingly, the answer is “not much.” Test song “The Way You Move” by OutKast ft. Sleepy Brown is known for its thunderous lows, but you could hardly hear it on the speaker. The volume control issue occurred too, but for different reasons. The S4 is so thin, it was awkward when trying to adjust the volume while it laid on the device. While driving, it works as a solution for those who have yet to upgrade their sound systems to have an aux port by allowing the “audio in” port. It is a little inconvenient, but it works for those not willing to spring for a better stereo, but being able to pair it using BlueTooth would have been a welcome feature even though the selling port is that you just put in on top of the speaker…meaning it will fall off in a car. Maybe the next time they could include a clip to keep the phone in place. 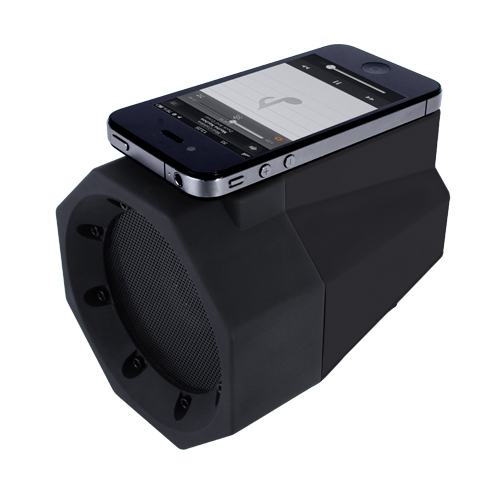 Overall, the Touch Speaker Boom Box is a well made amplifier that does what is advertised and had a remarkably long battery life. This would be a great buy for someone who is just hoping for the sound on their phone to be louder without regard to the sound quality itself. The charger is cross compatible with any mini USB charger, which is a huge plus for most Android users. I recommend this speaker, but at a price point of $39.99 you’ll find a BlueTooth solution that would cost less. This week: Jay & Wally talk with Bryan King, creator of the board/card game P.O.N.E., and the web-comic Neo-Earth. He gives great insight on what it takes to create and market a board game, drawing comics, making a fantasy cookbook, and having massive success at Pensacon. Star Wars Watch! makes it’s triumphant return with some much needed news, and then we slip into a philosopical discussion about Artificial Intelligence and Virtual Reality. This is definitely one episode you don’t want to miss! Visit www.neo-earth.com to check out P.O.N.E., Neo-Earth, and Vol. 1 Kingly Adventures Cook Book. This week: Jay & Steve talk about their experience at Pensacon 2015, how Wally is quite excited about Rock Band 4, Marvel is bowing out of San Diego Comic Con, trying to keep up with all the fantastic television content that is out there and failing miserably, @Midnight is the funniest show on TV, why we’re divided on Gotham, how Agent Carter freakin’ rules, and why here on the Gulf Coast we can’t have anything nice.